The first of these are any creatures with the ability to pay 1 R and pump up their power such as Dragon Hatchling , this effect can be added to any creature on the field with the enchantment Captive Flame . The second type of creature is rather large creatures that have a high power naturally without pumping such as Malignus or Serra Avatar. These creatures have a second use as well. I can attack with them before I fling them, or they can be used a board presence. Obviously with Captive Flame I can pump the type 2 creatures as well making them even larger. But whats more important with those larger creatures is a way to keep them alive or return them from the dead and somehow still being able to fling them. The first card for this is Kiki-Jiki, Mirror Breaker, using him to create a token of any one of the creatures, I now have two creatures that can attack, and a token to fling, especially since I already have to sack it at the end anyway. Another card is using Ajani Goldmanes -6 ability to create a token exactly like Serra Avatar, which coupled with Brion Stoutarms Lifelink ability, everytime I fling, I increase the power of a creature with such beauty. The next important card is for recursion, this is Reya Dawnbringer. By using her I can return a creature I just flung the turn before to the battle field, therefore having a repeating creature to sack. A less used, but still useful tactic is to use cards such as Zealous Conscripts or Act of Treason to take control of opponent big creatures, or just creature I want gone, and fling them. But using Brion Stoutarm is not the only mechanic, and honestly once my opponents figure it out, hell be a big target for anything that would prevent him from being used. So I will now discuss two substitutes that can be used to replace Brion Stoutarm. The first is simple Aggro. I use any and all creatures to attack that I can. This idea is simple and straightforward. No more explanation is needed. The second substitute is a card called Warstorm Surge. 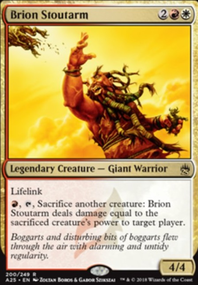 This card will allow any creature that enters that battle field to have the exact same effect that Brion Stoutarm gives, without sacking it, accept for the Lifelink ability, which is solved by having True Conviction on the field, which aids in the First Substitute by giving Double Strike. This mechanic is simple to use, and for many people can be over looked until used with deadly force. With smaller creatures, such as Moonveil Dragon, it becomes an effect that can slowly whittle away at an opponent, and with larger creatures, such as Malignus , it can be the scariest storm you will ever find yourself in. Now that the three big opportunities to destroy an opponent are out, I want to discuss some ways the minimize input, and maximize output. First, to minimize input; weve already discussed this a little with ways to creature token copies of creatures, take control of creatures, and resurrect creatures. The other way was mentioned as well, and that is Captive Flame , it allows for you to fling small creatures instead of big creatures, creating a stronger board position, but still allowing large initial damage. Pump effects can be easily increased through Koth of the Hammers -2 ability which doubles your mountains mana. Also, Lifelink abilities are usefull to maintain life even in tough situations, this comes from Brion Stoutarm, True Conviction, and is maximized through Boon Reflection. For maximizing output; the first is through damage output. Whenever one of your creature deals damage, Gratuitous Violence will double it out to opponents, now you can do the same thing for any source damaging an opponent via Gisela, Blade of Goldnight, she also has the added benefit of keeping you alive little long by cutting your damage intake in half. Now a quick formula to show you potential: use either Brion Stoutarm or Warstorm Surge to deal damage equal to a creature such as Malignus to opponent. Well assume the highest opponents lifepoints is 40; therefore initial input is 20 damage. With Gratuitous Violence on the field we double this to 40 points (theres a one hit KO)). Now we add one Gisela, Blade of Goldnight to double the new damage from 40 to 80, this is now double the starting total of any opponent, which any player will be hard pressed to reach that many life points, so this is an almost guaranteed formula to kill an opponent. But wait, we cant stop there now can we. If we add a Lifelinking ability to the equation via Brion Stoutarm or True Conviction, we now are gaining 80 life; tripling our starting life total. But I like to over kill a little sometimes, so of course well have Boon Reflection on the field, gaining us 160 life points which is where we will stop. As you can see, now that we have 200 life points, we are nearly invincible to attacks. The only really scary card is Sorin Markov with his ability to instantly reduce me to 10 life points. Now for kicks and giggles, do the math replacing Malignus with Serra Avatar or the equivalent, yes, it can, and has happened this way before. But we need to discuss some concerns. Obviously with the lifelinking ability we can build a nice pillow for our opponents to throw rocks at all day, but how to we keep our most important assets around such as Brion Stoutarm or Gratuitous Violence? Well, the answer is various artifacts such as Lightning Greaves to keep the most important creatures alive and well. Or Nim Deathmantle, even Akroma's Memorial has a very limited way to protect. But we need something for the artifacts and enchantments. Thats where Elspeth, Knight-Errant comes into play, assuming you can protect her long enough, you use her ultimate and have a beautiful emblem on the field. This will give indestructability, which protects against many things, and coupled with a Lightning Greaves, this gives your most important creature protection from targeting removal, and board wipes that deal damage. Only mass exile and the like are effective. Avacyn, Angel of Hope, Linvala, Keeper of Silence, and Blazing Archon all help along this theme. The extras are cards like: Martyr's Bond which allows you to keep your opponents from building to large of a board presence, and Sphere of Safety, allows you to protect against many simple agro attempts. And basic burn, which can be increased via previously discussed ways, with card like Magmaquake and Red Sun's Zenith. Planar Portal and Quicksilver Amulet give a good combo to have a 10 drop tutor from deck to field for any creature you want, which can give a pretty quick surprise if used with Warstorm Surge. Soul Conduit can keep you alive in a pinch, and has the added benefit of switching part of your situation with an opponent. Please comment and tell me what you think, any suggestions are welcome. Please +1 if you like it! So overall, the deck has done well, the Brion Stoutarm mechanic of flinging beasts works well, especially in combination with cards like Gratuitous Violence . But something I have found more recently has been happening when I win is alternate ways to kill my opponent. While my goal for this deck was to use Brion Stoutarm to kill opponents in two or three hits, and in combination with some attacking, or in later games when I need an opponent out fast and I'm not afraid of backlash, I'll drop a bomb like Serra Avatar and fling her same turn, most of the time killing my opponent out right. But recently alternate ways to win without even using Brion Stoutarm have happened more regularly. For example, just the other night I was playing against two friends, and one opponent put out the third opponent using two creatures. Next turn it was evident that I would be seriously lacking with a completely open field, and him having two Eldrazi on the field. So earlier I had placed a Warstorm Surge on the field, and so that turn, one drop of Serra Avatar, and I directed the damage towards the remaining player, winning the game. Over my playing, I have found that using Brion Stoutarm is very effective, but he is not always ideal. My original plan was to place him on the field and then place other creatures on as they came and fling them an opponents ways, but I found that opponents too quickly became uneasy towards him. Therefore, I've found that timing when I bring him out, only bringing him out when I'm ready to use him and not before, it imperative. Or not using him at all and seeking to use other ways such as my most recent game described above. Any thoughts on the alternate tactics to use in this deck? Maybe something I can consider to place in, or something that doesn't seem to fit these two overall themes? So 13;uh... 13;Brion... 13;How 13;far 13;can 13;you 13;throw 13;that 13;goat?